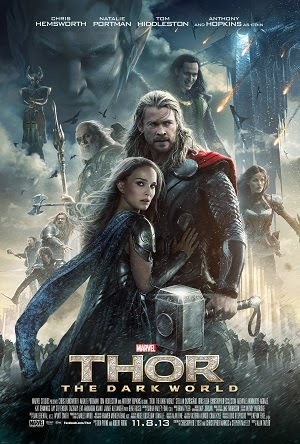 At the first Thor movie, I wished for a sequel that will allow Thor and Jane’s space or dimension realm separated world to find “convergence” following that concept from Thor 2. But the convergence need not be detrimental to both or all nine worlds (like in this sequel) but should simply allow them to see each more often, which seemed impossible when the bridge collapsed at the end of Thor 1. Back to Thor 2, it references not only the first movie but also the Avengers movie and even saved a spotlight for Captain America through a cameo role. And although Thor 2 is indeed all about The Dark World and its hidden powers through the indestructible ancient catalyst called aether and the white elven civilization protecting it, Loki stole the limelight several times throughout the film. I’m guessing that even the supposedly new villain introduced before the credits rolled out is in fact Loki in disguise. It could also be indeed a new villain and will become a reason for Thor and Loki to form a tag team once more, albeit the latter might betray the former all over again. Speaking of credits, as always, I stayed until the very last line was rolled out, and I wasn’t disappointed. Another teaser was featured, something normal for Marvel films. It was about Thor formally asking his father’s permission to leave Asgard to be with the one he loves on Earth. But the patriarch on the rebuilt throne seat (earlier destroyed when the white elves sought the aether in Asgard) was none other than Loki. I wonder what he did to their father (adopted father for him) again. The aether was in Asgard by the way because the catalyst accidentally used Jane to free itself from the dark world and Thor brought Jane to his home for medical errr... healing after she possessed uncontrollable, undetermined superpower (the aether) at that time when the gatekeeper (at Asgard) no longer sees her in mental sight. An interdimensional path from Earth (London to be exact) to the dark world led her to the aether when she was hoping to see Thor again. What didn’t seem right was death to supposed gods or at least ‘we’ refer to them as mythical gods but they do not let themselves be revered that way. In fact, Thor’s mother died in this sequel. His father, King Odin and Loki’s sort of discussion at the latter’s trial also proved that gods (their kind) ceases to exist after about 5,000 although I think the calculation appears inaccurate. Spoilers are not an issue anywhere since the movie had been released all the way back in October 30 (international release). I only got to see it at a movie house with my husband and daughter last Monday though. Good parenting bringing a 4-year old eh? Not! :D Anyway, the local cinema allowed her inside. As for Thor and Jane’s love story, although the latter may eventually die after a hundred years or earlier (which Thor was warned about by one of his close combat comrades), at least it was given an opportunity to flourish, at least for now, knowing how it may have to be paused again amid the end credits message “Thor will be back.” So he will and so will Loki.